Model 01 status: Arrived in Perrysburg, Ohio; still on track to receive it Monday. The day started with a very nice email from the CTO of a company called Dygma that is making a keyboard (possibly two? I think they have the extant Shortcut and the new Raise) that will be using Kaleidoscope and wants to have a nice graphical configuration tool in Chrysalis. They said that they had seen the things I had started pushing on the repo, had heard from Simon that I’d be helping out on the project, and wanted to let me know that my work is appreciated. It was a very nice way to start the day and really emphasized how I ended the last post about working on Chrysalis & Kaleidoscope, about how rewarding it can be to do work that others appreciate. I also got some slightly alarming news about potential issues with my in-flight Model 01, but that will hopefully turn out to be just a little bit of measurement error…fingers crossed. It is pretty cool that one of the two founders of Keyboardio personally reached out to me after noticing a tiny inconsistency though – especially when the co-founders are also new parents! The front-end part of the Chrysalis work is proceeding well. 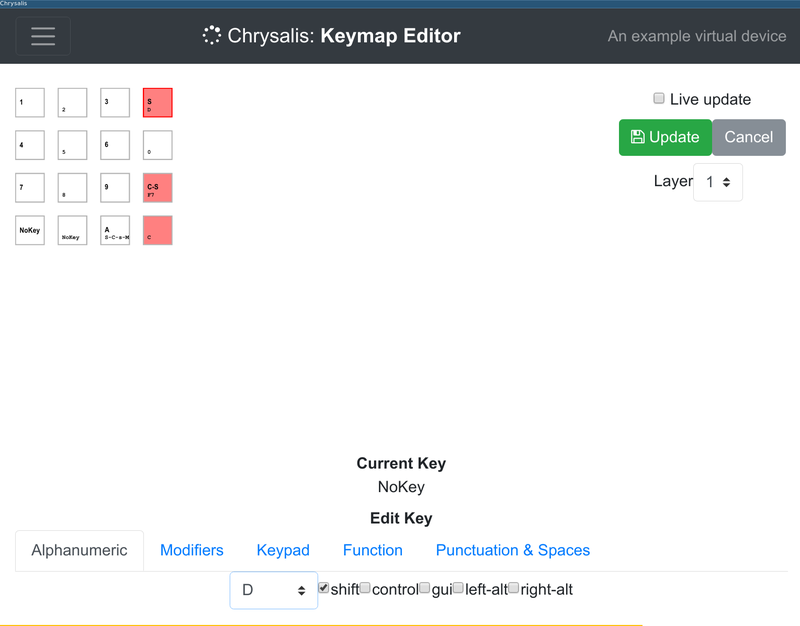 I had a chat with Simon about how we want the keyboard layout editor to work, which I think is going to be pretty nice. Figure 1: Keymap editor in progress - hopefully I’ll have a real device to test it on soon! Asking some questions from the very helpful Algernon on IRC, though, indicated that this was an incomplete view of the picture. While for normal keyboard keys, the low eight bits give the keycode of the pressed key and flags are used to indicate modifiers held, there are other uses. In particular, plugins often will want to have their own “special” keys that won’t be interpreted as normal keys. So, for example, when you put a macro key in your key map, the Key that is sent can be distinguished as something that the Macro plugin should handle, and not be treated as a normal key, or sent to another plugin. This is done by setting the high bit of flags (which is the RESERVED bitmask in key_defs.h). When this flag is set, it indicates that this Key should no longer be treated like two 8-bit values as normal, but can have any meaning that the plugin which created it cares to assign. You may wonder though, how to plugins avoid creating ~Key~s that conflict with each other? We know that setting the reserved bit means that it won’t be confused for an ordinary key press, but how do we ensure that a macro key isn’t misinterpreted as, say, a one-shot key? The solution lies in a library that had up until now seemed completely arcane to me, Kaleidoscope-Ranges. This single-file plugin defines one enum, is included by most plugins, but provided no indication of what the enum meant. After learning how plugins need to inject non-conflicting key codes though, this finally made sense. The enum is used to define the range of raw, sixteen-bit values that each plugin will inject! The enum starts with FIRST = 0xc000, which is 11000000 00000000 in binary – that is, flag bit RESERVED and INJECTED set, so the minimum value that could be injected by a plugin, plus another bit to reserve space for plugins operating without kaleidoscope::ranges.1 From there we see the various plugins defining the ranges that they will use (e.g. the first is the OneShot plugin, from OS_FIRST to OS_LAST, plus some internal separation into one-shot modifiers and one-shot layers). All in all, a productive & educational day. Updated 20 October 2017: Thanks Algernon for correcting my confusion about how INJECTED works – that flag is for keyState, not the Key, to prevent infinite loops of plugins changing key codes and then changing the key that they just injected.